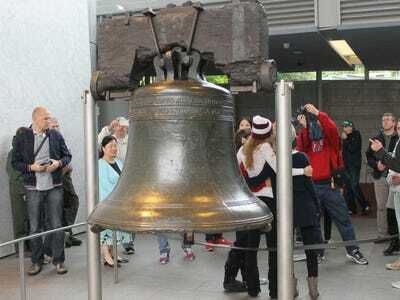 M. Woodruff/Business InsiderThe Liberty Bell. 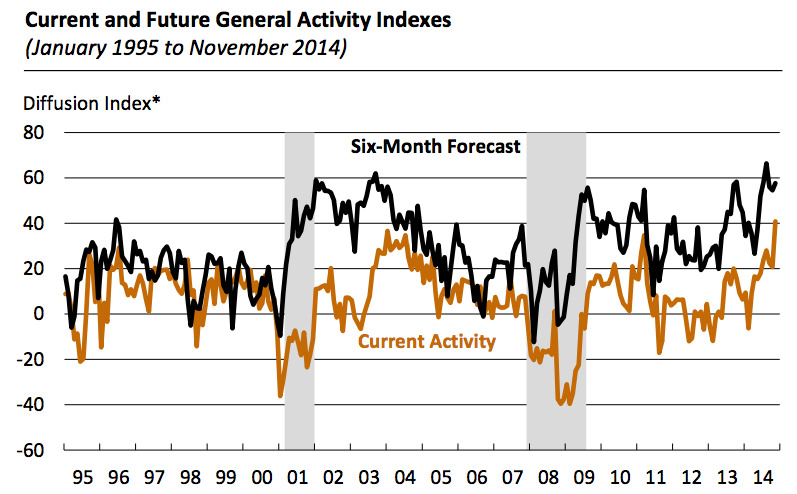 A reliable indicator of economic activity in the US just annihilated expectations. The Philadelphia Federal Reserve’s latest manufacturing report on Thursday came in at 40.8. This is the highest reading since December 1993. Expectations were for the report to come in at 18.5, down slightly from last month’s 20.7 reading. Following the report, stocks were moving off their lows, with the Nasdaq turning positive and the Dow and S&P 500 paring their losses but remaining down slightly. The latest report showed that the new orders index, which reflects demand for manufactured goods, rose 18 points to 35.7, as 44% of the firms in the report saw a rise in new orders compared to 36% last month. Labour market indicators in the report also showed improvement this month, as the current employment index rose 10 points in November to 22.4, a 3 and a half year high. There was also a significant increase in reported hours worked, with the average workweek index rising from -1.3 to 7.8 this month. The survey’s future indicators also suggest optimism for future growth, with nearly 60% of the firms surveyed expecting increases in activity over the next six month, with just 2% of firms expecting decreases over that period. Following the report, Derek Lindsey at BNP Paribas noted that, “Philly’s striking report runs counter to other surveys we have received this month,” with the Empire State manufacturing report and flash PMI reports coming in mixed. From the Philly Fed, here’s the chart of the headline index and future expectations.